Engineering design of wiring, harnesses, cable assemblies, control panels, hydraulics and pneumatics. 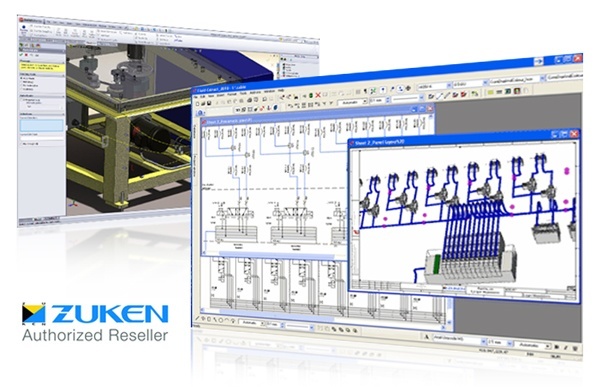 E3.series is a Windows-based, modular, scalable and easy-to-learn system for engineering design of wiring, harnesses, cable assemblies, control panels, hydraulics and pneumatics. Together with SOLIDWORKS Premium Routing tools, E3.series is a complete solution for the design engineer from design concept through physical realization and manufacturing output. Make a change in one view (e.g. schematic) and it automatically changes in the other views (e.g. cable, panel, formboard, BOM). Prevents errors in the design, reducing rework. Modular design using predefined sub-circuits stored in a library for easy access. Library parts contain the attributes that drive the DRC (e.g., AWG, predefined signals on pins). Routing netlist, library information for wires, cables, and components. Cross-highlight between electrical and physical domains. Advanced CAD engine designed for electrical schematic, harness, hydraulic and pneumatic applications. Stable, proven technology with thousands of users.